I was back on the loom again today. 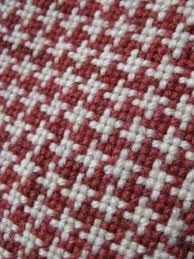 I was planning to make a hounds tooth pattern which was supposed to look something like this. I figured that I needed to so a 2x2 stripe sequence. I warped my loom to make a scarf. I got it all warped and ready to go. But, when I started weaving it didn't take me long at all that I wasn't getting the results that I was hoping for. I was making gingham not houndstooth. I was disappointed but I continued on because it still looked ok. So I wove and wove and wove some more. In the end I got a cool looking scarf that is a wee bit long as in over 7 feet long but I had fun and I get to say yes it is a cool looking scarf and I made it myself. I also made a Star Wars bag for K because he wanted one. I am not sure what I will make next but you can bet that I am going to try for houndstooth again and this time I know where I went wrong. As always if you know of any knitting, weaving, or sewing patterns that I could try don't hesitate to let me know. I am always looking to try a new craft project.